Only a handful of today’s artists can claim their success began with YouTube, and even less, if any, having then been named alongside such luminaries as Richard Pryor, George Carlin and Eddie Murphy in Rolling Stone’s recently released list of the 50 Best Comics of All Time. In comedian Russell Peters’ case, “success” may be a drastic understatement. Russell Peters started doing stand-up at the age of nineteen at open mics in his native Toronto in 1989. He spent the next fifteen years honing his craft at clubs across Canada and the UK. In 2004, Peters gained critical and global recognition for his CTV “Comedy Now!” special which wound up on YouTube. Peters says: “I never put the special on YouTube. I still don’t know how to upload anything on the web to this day.” That upload launched a new level of fame and unforeseen success. It also led to larger and larger shows, not only in arenas in his native Canada, where he became the first comedian to sell-out Toronto’s Air Canada Centre in 2007 (as of today, six times and over 100,000 people), but to arenas in the United States, the UK, Australia, South Africa, the Middle East, Eastern Europe and Asia. The subsequent tours were captured in his phenomenally successful specials broadcast on Showtime and Comedy Central: Outsourced in 2006; Red, White and Brown in 2008; and, The Green Card Tour in 2010, which went on to set a UK attendance record for a one-off comedy show with over 16,000 fans in attendance at London’s O2 Arena. In 2013, Peters became the first comedian to create a Netflix Original Comedy Special. Recorded in front of over 14,000 fans at Sydney, Australia’s Allphones Arena, Notorious became a global success for Netflix. In conjunction with Notorious, Peters allowed cameras to follow him on-tour for a behind-the-scenes, four-part documentary series, Russell Peters vs. The World, also exclusively for Netflix. Peters’ most recent world tour, Almost Famous, a celebration of his twenty-five years in the business, once again set attendance records across the globe, from Canada to Singapore to Madison Square Garden, resulting in his being nominated alongside Jeff Dunham and Kevin Hart as “Billboard’s Top Touring Comic in 2015.” The corresponding special; Russell Peters: Almost Famous, premiered on Netflix in October of 2016. Peters hasn’t stopped there, as evidenced by his recently being rewarded with a 2017 Peabody and Emmy Award for Executive Producing the critically acclaimed Netflix Documentary Hip-Hop Evolution. He and his production company have also self-financed and self-produced his specials, while his corny, light-hearted take on Christmas, 2011’s “A Russell Peters Christmas,” became the highest rated Christmas special in Canadian Network, CTV history. In 2010 Peters book, Call Me Russell was published by Random House Canada and went on to become a number one bestseller. The book was a candid memoir of Peters’ life, family and career and is a must-read for any up-and-coming comedian. Russell Peters has no shortage of accolades. He maintains a staggering social media presence as his YouTube videos have amassed well over 250 million views, and a Twitter following of over four million people. Professionally, his DVD’s have sold upwards of a million copies, while his Notorious World Tour became the highest attended comedy tour ever in Australia, the United Arab Emirates, Oman, Lebanon, South Africa, Thailand, Indonesia, Singapore, Malaysia, Hong Kong and his home country of Canada. Peters has sold-out Madison Square Garden, Radio City Music Hall, San Jose’s HP Pavilion, New Jersey’s Prudential Centre, the Chicago Theatre, LA’s Nokia Theatre, the Sydney Opera House and the Hammersmith Apollo. In November 2012, Peters became the first stand-up comic to perform at Brooklyn’s Barclays Centre with over 10,000 fans in attendance. As a result, Peters has been named on the Forbes List as one of the top ten highest earning comics in North America in 2009, 2010, 2013 (finishing third), 2015 (fourth) and 2016. Peters who has transitioned his talents into both the small and big screens, recently starred in the Netflix limited series, The Indian Detective, alongside Anupam Kher and William Shatner. He also recently starred in the The Clapper opposite Amanda Seyfried, Ed Helms and Tracy Morgan; Supercon with John Malkovich and Ryan Kwanten; Ripped opposite Faizon Love; and, Adventures in Public School with Judy Greer. He recurs on the CBS hit show Life In Pieces, lent his voice alongside Scarlett Johansson, Bill Murray and others in Disney’s adaptation of The Jungle Book and co-starred alongside legendary comedic actress, Carol Burnett, in Netflix’s nonscripted series A Little Help with Carol Burnett. He was a judge alongside Roseanne Barr and Keenan Ivory Wayans for NBC’s reboot of Last Comic Standing, and lent his voice to the animated feature, Ribbit, and to numerous episodes of the iconic animated Fox television show Family Guy, Bojack Horseman and Bob’s Burgers. He was also awarded a Gemini Award, Canada’s version of the Emmy, for hosting the country’s Juno Awards Show. Other notable film roles include the recent Jon Favreau directed indie smash hit Chef, the 2011 sci-fi movie Source Code, alongside Jake Gyllenhaal, the Canadian ice hockey hit Breakaway, where he also served as Executive Producer and the Eva Mendes indie, Girl in Progress alongside Mendes and Patricia Arquette. Among Peters’ many appearances, include stints on The Tonight Show with Jay Leno, The Jimmy Fallon Show, Jimmy Kimmel Live, Lopez Tonight, Craig Ferguson, the Queen Latifah Show, Def Comedy Jam, Jay Leno’s Garage, Top Gear America and United Shades of America. 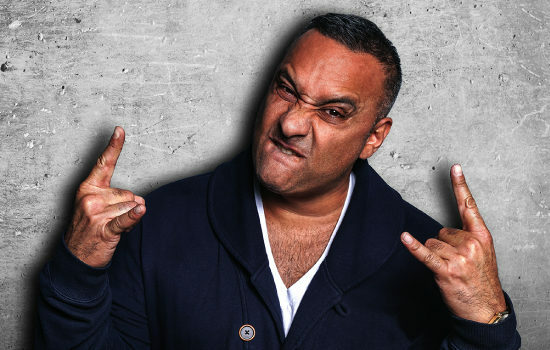 Russell Peters was born and raised in Canada, after his parents had emigrated from India in the 1960’s. From a solidly working-class family, Peters learned the value of levity from his father and Russell’s own observations on the family’s struggles with racism and multicultural differences. Peters has also given back to the community that embraced him by creating The Russell Peters North Peel Scholarship, rewarding deserving college students from his old high school with a $20,000.00 scholarship, and a generous donation to his hometown Brampton Civic Hospital, where their Palliative Services Wing was subsequently named after his late father. Peters has performed for the troops in Afghanistan, Iraq, Djibouti, Pearl Harbor, the USS Eisenhower aircraft carrier through the USO and on the Canadian vessel HMCS Winnipeg.